How are you all doing? Are you getting ready to go back to school this month? 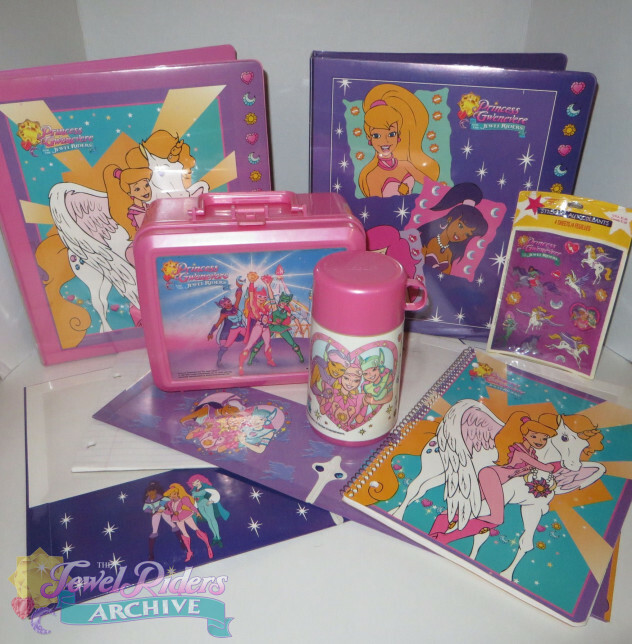 Perhaps you’d like a few magical back-to-school supplies to make the transition back to the classroom a breeze? We also wanted to direct you back to the Characters Guide, where we have updated with pictures and descriptions for all the Season Two characters! It seems like we were just here celebrating “Christmas in July,” but there’s more to add! Ronnie has finished an excellent video comparing the storyboard animatic to the finished animation, and it’s a real treat to watch for fans of traditional hand-drawn animation. Ronnie has also been busy adding several new videos of the openings from the commercial release VHS tapes, so be sure to check those out at our YouTube channel. 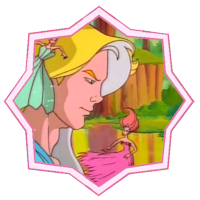 We also wanted to take a moment to give a shout-out to our friend Jacquesworth over at our sister site, The Avalon Archive. 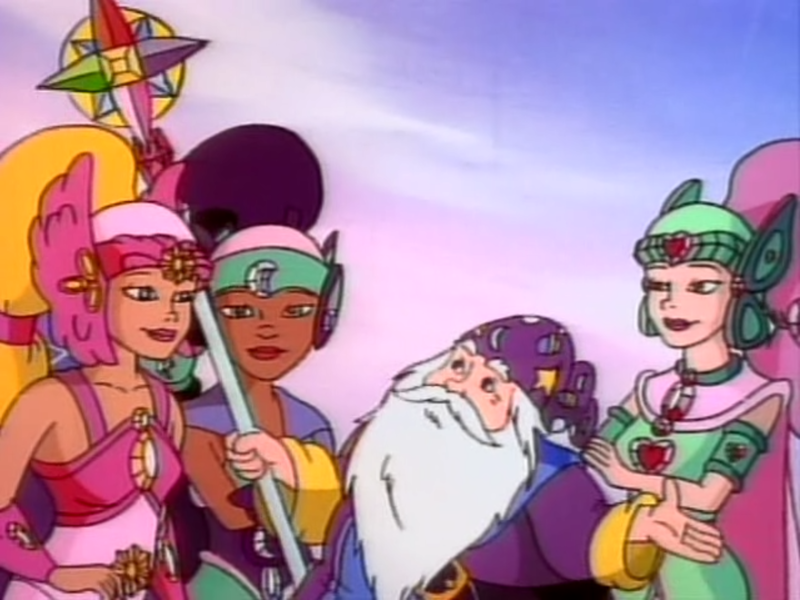 For those who don’t know, the book series Avalon: Web of Magic is a modern retelling of Princess Gwenevere and the Jewel Riders, and the Avalon Archie. Ever since the book series ended a few years ago, fans lost track of the author Rachel Roberts and editor Robert Mandell (the creator of Jewel Riders). Well, recently they turned up in a tip to the Avalon Archive. 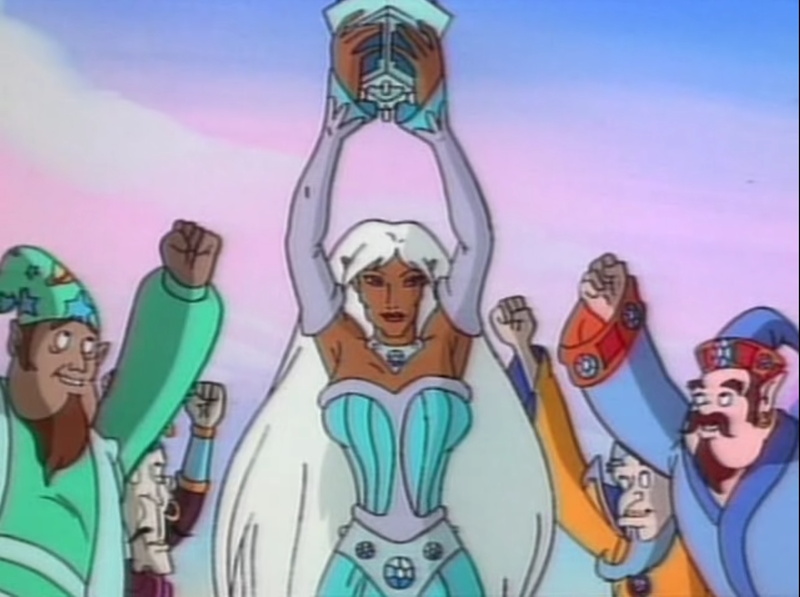 It appears that Robert Mandell has launched a new publishing imprint called Voyager World, which is not only putting out a new novel by Rachel Roberts, but also actively working on development for an Avalon: Web of Magic animated series! This is really exciting news for Jewel Riders fans, as it’s probably the closest we’ll ever see to an animated reboot for the show. The art looks incredible, and I heartily suggest that you take a few moments to look at the development work being done. The Avalon Archive is following all the updates as they happen, so stay tuned to their site for more information! Well friends, this is it. We’ve arrived at the end of a two year project. 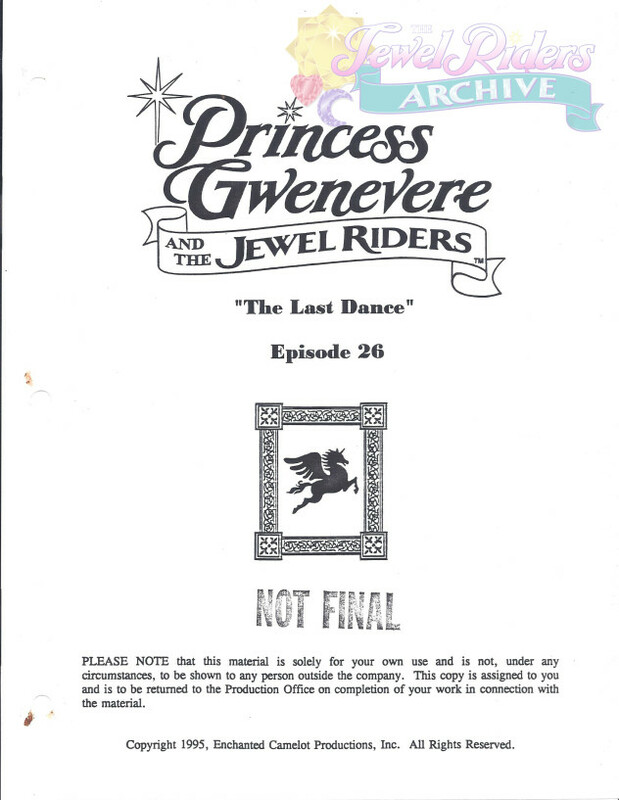 Over in our Season Two Scripts page, you’ll find the final script for Jewel Riders: The Last Dance. This was retitled “The One Jewel” for the final release, but ever since I saw the working titles on Stormy’s site so many years ago, I’ve always been fond of “The Lady of the Lake/The Last Dance” as the pair of titles for the final episodes. It has been a privilege to share these scripts with all of you, and I hope you have enjoyed the fruit of many hours of labor over a temperamental scanner. 😀 It feels strange to think this is the last month that our update will include a script scan, as it has been a staple of our updates ever since we opened our virtual doors. I hope if you haven’t taken a chance to read some of them, you check out Season One or Season Two and enjoy all the little tidbits that didn’t make it into the final production. 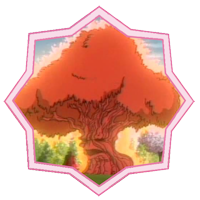 We are still missing the script for the episode “The Wishing Jewel,” so if you happen to have a copy and would like to share scans we (and the fandom!) would be most appreciative! Click the link to read the final script! There are some fun tidbits in this script, including a strange note in the Cast of Characters that says “Morgana as the Sea Witch.” We looked over the script for more info, but nothing apparent pops up. Do any of you eagle-eyed fans catch any more references to this bizarre casting? Also, keep a look out for names for the dweasels from Dweasel Nook: Pepe and Gidney! And they’re cousins to Rufus and Twig! Also note: another named Wizard, this time named Tiberius! Sadly, they never say which Jewel was his. 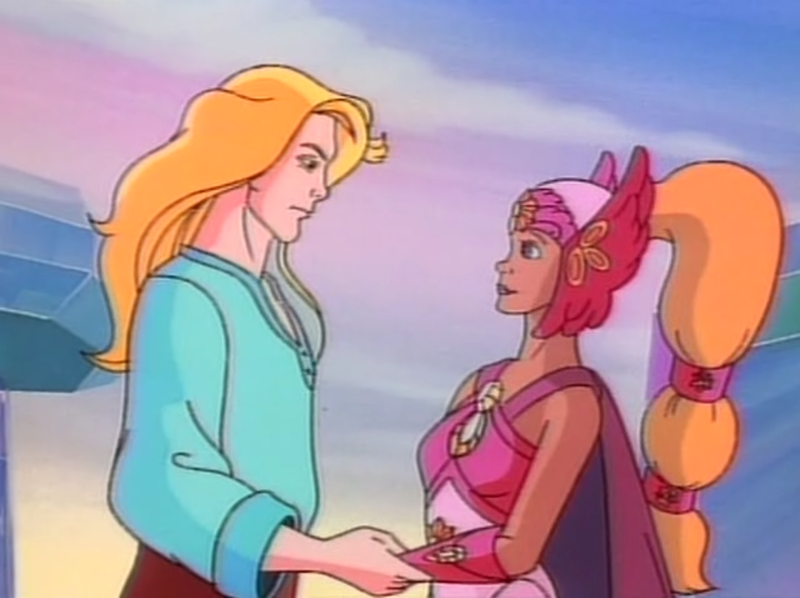 “The One Jewel” is a charged and emotional ending to the series, a true rarity for a piece of 90s television animation. 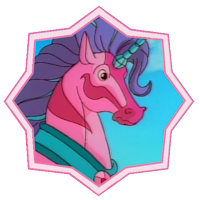 But we can’t help but wonder what happened to our Jewel Riders after Merlin’s final words. Oh, I will definitely be checking out that Web of Avalon show and Roberts’ new novel. Thanks for sharing that! Its been forever since I found others who loved this show excited for this site! Thanks Galen! Stay tuned for some great updates over the next few months as we release all the episodes of the second season – both Gwenevere and Starla versions!